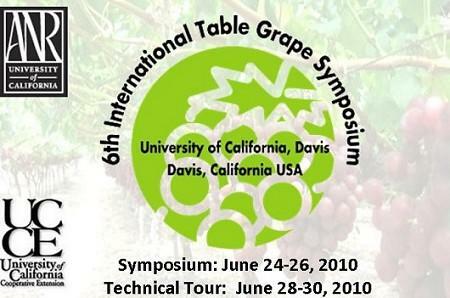 PROCEEDINGS OF THE 6TH INTERNATIONAL TABLE GRAPE SYMPOSIUM ARE NOW ONLINE! Please click on the link below to view. Manuscripts are searchable in the order that they were presented or by author. The organizing committee would like to thank meeting participants, speakers and poster presenters for their valued contribution to the 6th International Table Grape Symposium. The meeting was an opportunity to reconnect with international colleagues, share ideas and foster new collaborations on future research projects. We look forward to the next meeting, which is planned for Australia in 2013. The Australian organizing committee is currently being formed but parties interested in participating in the next symposium may contact David Oag for more information or to send your updated contact information. Photos of the 6th International Table Grape Symposium and the Techinical Tour have been published online. Please click on the links below to view. Hope they bring back many fond memories. Enjoy!